There are a couple of things that I was unsure of when it came to towing, for starters, it’s not massively clear who can tow what. 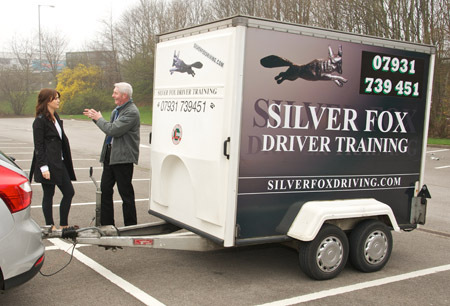 The common misconception is that people my age (26) can’t tow because we don’t have the right licence – this isn’t completely true, as I recently found out when I met Stephen at Silver Fox Driver Training for a morning of towing. 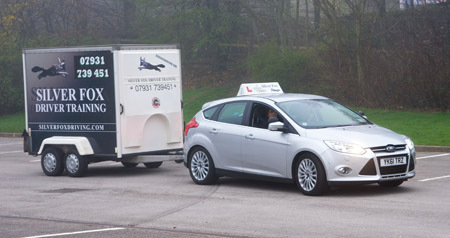 Driving instructor, Stephen, has towed caravans for over twenty years; much of his business comes from caravanners and commercial drivers needing introductory or refresher towing courses as well as those seeking training in preparation for a B+E test. Before we got started Stephen was keen to have me understand licensing legalities, learn vital pre-journey checks and have an good idea on how to manoeuvre and reverse before getting behind the wheel. If like me you passed your driving test after January 1st 1997 and hold a Category B licence, you are legally allowed drive a combination (car & trailer) up to 3.5 metric tonne (3,500 kg) without taking an additional test. This means that the Maximum authorised mass (MAM) i.e. the tow car and the trailer (in this case a caravan) as a whole unit must weigh less than 3,500 kilos. Post 1997 drivers can also tow any trailer up to 750 kilos gross weight, which to put into perspective is equivalent of a large camping trailer or a small caravan, possibly an older model. The trailer I tow here weighs less that 1 tonne so could be towed legally without a test. To drive a combination greater than 3.5 tonne requires a B&E test. Even a modest towing outfit of modern towcar and modern tourer packed with the things you need for a holiday can often exceed the 3,500kg MAM. How do I book a B&E test? You can book a B&E test as you would a standard driving test via the Gov.uk website. Tests are held at LGV Test Centres (as appose to normal test centres) as they have space for manoeuvring. The average practical towing test takes around one hour and 15 minutes. 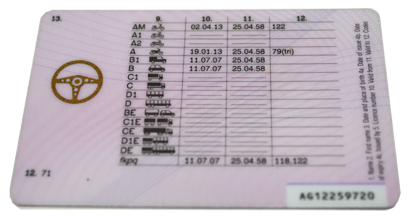 During the examination, drivers tend to go further afield and can be asked to drive on the motorway. 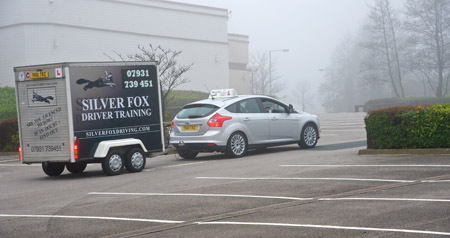 A B&E practical towing test costs £115 and for pre-test training drivers can expect to pay between £500 and £600 for two days’ training. What are the speed limits and road rules for towing? You can use the outside lane of two lane motorway to overtake but not a three or a four lane motorway. Additional information can be found in the Highway Code which is available to read online here. Once I understood of the legal aspect of towing, it was time to begin ‘hitching up’ which (for those like me who are new to this) simply means attaching the trailer to the tow car. I must admit – I was surprised how heavy the the handbrake was! You may want to get someone to help you with this. I was quick to think I’d done this right the first time, as it turns out I hadn’t so always make time to double-check. Should I alter how I drive when towing? There are certain aspects of your driving that will need to change when towing a caravan, these include: judgement, control, speed, positioning and road awareness. To get these right you must be first be positioned correctly in the driver’s seat. If you’re towing in your own vehicle the seat should already be in a position you are comfortable with but it is worth double-checking before you tow. Top Tip: Stretch your arms out in front of you and rest on the top of the steering wheel. Your wrists should sit on the top of the wheel. Adjust the seat back or forwards if not. Why are mirrors so important? The side mirrors are critical to towing because they are the only mirrors that will give you a view of the traffic situation behind you. You can tell if they’re adjusted correctly by checking that you see down the side of trailer. Extension mirrors will almost certainly be required with a caravan behind. When moving off bear in mind the amount of weight you’ve got behind you. Most cars (even small engine vehicles) require extra acceleration when towing, especially on hill starts. Don’t worry if you stall the vehicle like I did; remember to control the clutch slowly. What’s the best way to practice manoeuvring and reversing? Slowly drive forward to get the trailer and tow vehicle in-line. Use the side mirrors to check the position of the trailer in relation to the car. Aim to have the same amount of trailer both sides. As you reverse, the trailer will tend to move slightly towards one side, in order to prevent the trailer ‘jack-knifing’ always steer the car towards the bias of the trailer to bring the combination back into line. Move slowly, scan mirrors, use clutch control and look for any movement from the trailer. For extra control don’t cross your hands over the steering wheel. I learned that the trailer responded better to slow, small steering movements. By repeatedly scanning your mirrors you’ll pick up the first signs of it moving and steering just a little will correct it before it goes any further. Move too fast and you could risk falling into a snaking situation. Because caravans tend to be wider than the trailer shown here, it’s much harder to spot movements using only the tow vehicle’s mirrors. Top Tip: Extended mirrors are a must-have for any responsible tower – they’re the only way to see right the way down the caravan. What’s the most important thing to remember when out on the road towing? When Stephen and I set off, it became clear that I had picked up some pretty bad habits in my seven years of driving (keeping hold of the gear stick, not leaving enough room between me and the car in front etc, etc). It’s important to iron these out as soon as possible and to adopt the techniques used when you first passed your test. The ‘two second’ rule is a good example to start with. Whenever you’re towing leave a two second gap between yourself and vehicle in front to avoid getting too close. Allow extra time to slow down than you would normally – consider the weight of the trailer in particular. When stopping in traffic a good way of checking that you’ve left enough space is to use the ‘Tyres and Tarmac’ rule, whereby both the tyres of the vehicle in front and part the road surface in-between are visible when you’ve stopped. If the vehicle ahead fails to move off for any reason with the space you’ve left will allow you to get around without the need to reverse. Check both mirrors before slowing down and apply breaks early. 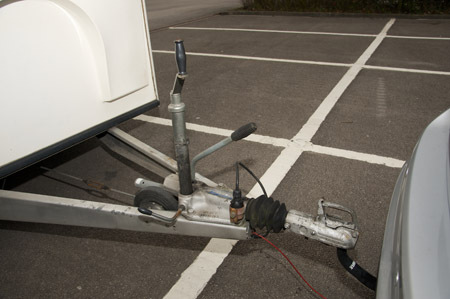 Always be aware of the caravan’s overhang when turning; slow movements help to prevent any problems. When travelling downhill remember that the weight of the caravan will effectively push the tow vehicle and may increase acceleration. This is important to note in areas with speed cameras. Accelerating proved especially tricky for me, I didn’t realise just how much power you need to get the car and the trailer up to 30mph. Using low gears helped to overcome this. During the session I was asked to cross two or three roundabouts; the important thing to remember here is to leave plenty of room when emerging. To me it seemed to take forever to get out at first but I needed the extra space to manoeuvre and accelerate. Does Caravan Guard offer a towing course insurance discount? We do! If you are new to caravanning but have any experience of towing, which includes having been on a towing course and/or taking your B+E test, you’re eligible for our 10% introductory no claim discount off your premium. Have we missed anything? If you have many years’ experience and can offer beginners like me further advice, let me know using the comment box below. The most important thing when towing is to enjoy it. relax,drive smoothly,the caravan will follow you wherever you go like little dog.Make every manoeuvre giving yourself plenty of time and space. If you passed your driving test before 1997 and don’t have any other restrictions on your driving licence, you are allowed to tow any legally matched car and caravan. Check out our guide to safe caravan towing for information on legally matched car and caravan outfits. Those who passed their driving test before January 1997 are allowed to drive a vehicle and trailer combination up to 8.25 tonnes MAM. There are more details on the Gov.UK website here. No Vaughan, I’m still trying to recover! In all seriousness, it’s all about keeping the caravan moving slow and steady. Great article, cleared up a number of misconceptions. On your reply to Peter followed the “click here” to go to gov web site, more good info. Concerned by max. Towing length 7metres with tow vehicles up to 3500kg as many caravans total length now exceed the 7metres. The latest adriana are over 8 metres . What can you use to tow these caravans with or have I misunderstood the 7metres ? I’ll double-check with Stephen and get back to you as soon as I can. I’ve spoken to Stephen regarding your query and can confirm that the maximum length of 7 metres (and max width of 2.3 metres) does not include the coupling or drawbar. It refers only to the caravan’s body. Bigger caravans are available (e.g. showman’s types) but these cannot be towed by a category B (3500kgs) vehicle, “You’d need a small lorry for that”, Stephen says. Before I towed for the first time I did the same as you and had a short lesson. One thing I do remember is that when reversing in a straight line, watch the caravan in your mirrors and if it starts to appear more in your passenger mirror then turn your wheel to that side to straighten up, or vice versa. You need to remember to do things backwards so that and going slowly helps. That’s right, it does take a bit of time to get used to reversing. Practice makes perfect! “You can use the inside lane of two lane motorway to overtake but not a three or a four lane motorway”. I’d call that undertaking and towing or not is frowned upon, perhaps you meant you can use the outside lane of a two lane motorway. Perhaps a proof reader would be useful before you publish beginners advice? I did – apologies Tony. In Getting started section5 you say reverse the caravan up to the tow car. Should it not read reverse the tow car up to the caravan ?? My mistake, thanks for bringing that to my attention Raymond. I drive a Motorhome 3500kg ,what weight trailer can I tow ? I’ve had a driving licence since 1976. According to Gov.uk, if you passed your driving test before January 1997 you are allowed to drive a vehicle and trailer combination up to 8.25 tonnes MAM. I’ve run your query passed Stephen who may have further details. “Anyone with BE on their licence (pre-’97 acquired rights, or post ’97 after a test pass), can tow a trailer up to 3500kgs PROVIDED the trailer is within the towing capacity of the tow vehicle. Best practice is never to tow anything greater than 85% than the kerbside (lightest) weight of the towing vehicle, by the way. I strongly suspect the a motorhome’s towing capacity will be restricted due to the majority of the weight being built-in to the motorhome itself, leaving only a small capacity for the extra stuck on the back. It states that extra acceleration is needed especially on hill starts and when moving off. We don’t advise accelerating at any other point. Hi, very good article, i hope lots of people read this and realise they are ilegal! You state that the trailer you are using wieghs less than a tonne so can be towed on normal licence! But i thought it was the maximum authorised mass wieght that the rules go by? Ie your trailer to me looks like it weighs about 550kgs but would probably carry 2 tonnes making it about 2.6 tonnes which doesn’t leave much wieght for the car up to 3.5 tonnes. Am i wrong? The trailer’s MAM is 1.4 tonne (1400 Kgs) and the car’s MAM is 2.0 tonne (2000 Kgs). So the total MAM is 3.4 which is therefore under the 3500 Kgs ‘allowance’ and so legal for me, with a cat B licence, to tow.